Enjoy a free sample of a back issue of The Septs. Click here to download the issue from April 2010. 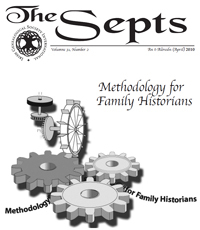 The theme for this issue was Methodology for Family Historians. Check back here periodically to see other free samples. If you enjoyed this issue, think about joining IGSI so you can get each new issues as it come out and be able to freely access all past issues.